One very important item in the "Performance Specification" page of any car is the power of the engine. CelloMom explores what exactly you need all that horsepower for, and how much is enough. Let's put the conclusion right here: 76HP is enough to cruise the nation's interstate highway system at 65 mph in a large family sedan (except in high winds). Read on for details, and to check my math. To tell the truth, a single horse can be hitched to a car and move it forward. Heck, even a scrawny child like CelloPlayer could push a car. CelloMom herself has done it often enough, to help her dad start the car when the battery has run down. CelloMom's dad believed that jumper cables were for helping other people jumpstart their car. Of course, a child-pushed car will only go as fast as the child can run. Same for the one-horse car. But even an infinitely swift horse will not be able to pull a car faster than some maximum speed. It's because of air resistance, which you can feel as in your face when you bike at decently high speeds. v is the speed of the car. If you look at the equation above, at standstill (v=0), there is no air resistance. But once you're moving the power rises rapidly, as the speed cubed. This means that in order to go 50mph on a country road, your engine has to put out 8 times the power it does as when puttering around town at 25mpg, just to deal with the drag. The larger the car, the larger the frontal area A, and the larger the drag. For a truck, A is seriously larger than for a Mini. A truck's drag coefficient is also large, close to Cd=0.6 or more, because a truck is basically box-shaped. Cars try to resemble a bullet in their outline, or better yet, a fish, in order to minimise the drag coefficient while still harbouring a decent space inside. For many passenger cars, Cd~0.3. Finally the density of air is quite small, so you don't feel the resistance until speeds get fairly high. A medium like water has a much higher density, ρ= 1000 kg/m3, so the resistance is that much higher, as we all know when we try to walk in a swimming pool. We're ready to try out some numbers. In the following, we'll consider the "vanilla" largish car, one that weighs 4000 lbs with a full load of a few passengers and luggage, or about 2000 kg. This car is 2m wide and 1.5m tall (think of a Toyota Camry or a Honda Accord). Oh, and CelloMom does everything in metric, because that way all the equations are simple. The only concession is that in the end we will convert Watts (W) to Horsepower (HP): 1HP = 746W. Sigh. Let's take the vanilla car out on a highway cruise, at 65 mph or 30m/s. At that speed, Pair = 14.6 kW = 19.5HP. Speeding at 80 mph takes nearly twice as much power: Pair = 36HP. Think of that next time your right foot becomes heavy. Once on a camping trip in a 1985 VW van that belonged to CelloMom's dad, we met a hurricane. The wind was coming in straight at the windshield, but we had a ferry to catch so we kept going on that highway. The VW's frontal area was large because of its height; its boxy shape gave a large drag coefficient; it had a 1.8L boxer-type engine. All in all, we could go no faster than 60 mph, even with the accelerator pedal pushed all the way down. But considering the wind was in our faces, the effective total wind speed was probably close to 100mph. (Arrived at the shore, we found that the ferry was closed down for the day). Crr is the coefficient of rolling resistance, another fudge factor. 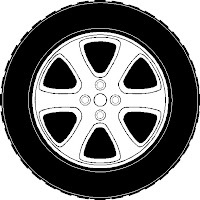 Crr depends on the size of the wheel and the material of the tire and the road surface. If you've ever chased a marble or a ball bearing down the pavement you know that hard round things have a small Crr: they can keep going forever. Try it with a steel ball bearing in a steel mixing bowl from the kitchen (Crr less than 0.001). Carriage wheels were made of wood with a band of iron on the outside: that made it easy for the horse who had to pull the carriage - but the noise! And the passengers tended to get their teeth rattled inside their heads. The rubber on a car's tire takes away that nasty effect by absorbing the impact of road roughness, but that means the rolling resistance is also larger, Crr = 0.01 for most car tires. Prr also increases with the weight of the car because after all, it's gravity that does the job of mushing the tires onto the road surface. For our vanilla car going at 65 mph, Prr = 6 kW = 8HP, or about 40% of Pair. This is one reason why fuel-efficient cars tend to be lighter: decreasing m also decreases Prr. But still: if you stick to the speed limit, you never need more than 28HP to move your family sedan on an interstate road trip. On flat interstate highways, that is. But this country is not flat everywhere, thank goodness. Its hills and mountains are as much part of its beauty as its vast plains. α is the angle the road surface makes with the horizontal. It makes sense that Pg increases with m, the car's weight, and that it is zero when the road is horizontal, that is α = 0. But notice that Pg increases with v! That is to say, in the absense of rolling resistance, you can get up that hill even with a puny power; it just takes longer. This is why loaded trucks slow down on uphill stretches of road. Not all of us have all day, so one of the specifications for the construction of US interstate highways is that the grade must be 6% or less, that is, for every 100 yards travelled horizontally, the vertical rise is 6 yards or less. To a good approximation, sinα < 0.06. So heading for a hilltop at 65mph on an interstate, the engine is asked to put out at most 36 kW = 48 HP to deal with the rising altitude. If you include the 20HP for the air resistance and 8 HP for the rolling resistance, you arrive at a Grand Total of 76HP. 76HP is enough to cruise the nation's interstate highway system at 65 mph. If you are generous with yourself you can double that and put a 150HP engine in, which lets you live a little, and go 80mph on most interstates with a fully loaded car. It also helps in very windy conditions, like a hurricane. Who needs 250HP, even 350HP in a family sedan? Germans on the Autobahn, that's who. Once, after a business visit to a company in the south of Germany, CelloMom was kindly offered a ride to the airport by her host, a German named Klaus, who drove a Mercedes station wagon. We were calmly talking business, until CelloMom glanced at the meters and realised we were going 200kph or nearly 125 mph. It was a quiet stretch of German Autobahn at a quiet time of day, but passing trucks who were only going 110kph or so, just a few feet away in the next lane, was a little nervewracking. At the airport, CelloMom thanked Klaus politely but climbed out of his car slightly shaken, resolving to take the train next time. At Klaus' cruising speed of 200kph, or nearly 60 m/s, Pair = 160HP and Prr = 16HP. If the uphill slope on that Autobahn was at most 6%, it would require an additional Pg = 96HP from the engine. So Klaus would need an engine with at least 272HP, and 350HP would not be too much. If he habitually drives faster, he might need more horsepower in his engine. But we're talking white-knuckle speeds over 125 mph. There is one other reason to have huge amounts of power under the hood, a reason beloved of jackrabbits and their close relation, the average human male everywhere. Ah, sweet acceleration! That feeling that you're going somewhere. One of the specs prominently featured, especially for cars at the high end of the power spectrum, is how long it takes to accelerate the car from 0 to 60mph. For any self-respecting muscle car, this time is quite a bit less than 10 seconds. Let's see what that means for the power requirement. The energy of a car travelling at a speed v is E = ½ mv2 (with m the mass of the car, also known as weight). Our 2000 kg car going 60mph would have an energy of E = 719 kJoules. The power to accelerate this car to 60mph in time t is P= E/t, or the other way around, t = E/P. This tells you what you already knew: the larger the power, the shorter the acceleration time. At 100HP (75kW), t = 9.6 seconds. At 400HP, the time is shortened to t = 2.4 seconds. At accelerations like that, you can use your car to hug your friends: you merely put down your foot on the accelerator, and your friends are pressed into the passenger seat. You can get away from the traffic light ahead of anybody else - this is really what it's all about, right guys? You can jump into highway traffic without having to wait for the safe gap between cars. You can cause the groceries to rattle around in the trunk and the eggs to slide and go splat against the rear wall. You can wreak havoc on cellos and other delicate musical instruments. CelloMom can live without all this sound and fury. CelloMom needs her eggs to come home whole, and needs to protect the rented cello. And CelloMom has learned (the hard way, it should be said) that leaving on time beats driving like a jackrabbit by a long shot, preventing wear and tear both on the car and on the nerves. And CelloPlayer would ask, who needs 350 horses? All you need is one horse. Add a saddle, you're set to go. 1. What's so clean about diesel? Really good :-) thank you. really enjoyed this analysis, thanks for creating this article! I loved it, thank you so much! Your aerodynamic drag equation has a mistake. You have it listed as depending on velocity cubed but it should be squared. It looks like you used v cubed to estimate your wind drag and so they are too high. Thanks for scrutinising my writing! You are right that the aerodynamic drag, which is a force, goes like velocity squared. However, the power (P=F.v) goes like velocity cubed.